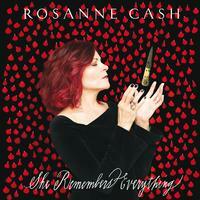 Roseanne Cash proudly announces her first new album in nearly five years, She Remembers Everything. The poetic, personal and incisive collection features ten songs, all written or co-written by Cash, that reckon with a flawed and fragile world from a uniquely feminine perspective. In the wake of the latest tsunami of survivor stories, Cash has had to contend with the fact that much of what she hoped would change across her lifetime really hasn't. It’s a reality that is reflected in her deliberate embrace of women’s narratives on the new album. This deluxe version features 3 bonus tracks in addition to the ten-song regular release. "There is a woman’s real life, complex experiences and layered understanding in these songs. I could not have written them 10 years ago—not even close. Time is shorter, I have more to say."